There this problem, I call it "washout range". Pay attention -- shop opened, the goods of different interesting and full of trips to this store want, and buy something not give. But time passes, say, six months. Shop does not know. Previously, five types of oil was now the force of two. Earlier in refrigerators and shrimps of various calibres were offered, but now remained one pack, and the prawns have turned from red to red, and the stack exactly, no one will buy it, no one even deign to steal (steal bad). Looking for something to do. Ideally, when building an application provider wishes to a «magic button», when you click on that, the order would be formed fully automatically. Oddly, the design we met at this «Technical task». Let us consider in more detail how the automatic building applications for the supplier. To this end, in the register of goods TTSU, switch to the point where the supplier usually delivers the goods. This may be central warehouse, where goods are distributed to outlets. This may be a point of sale, if the supplier delivers the goods directly to the point. For example, dairy products are often shipped directly to the store, bypassing the store. 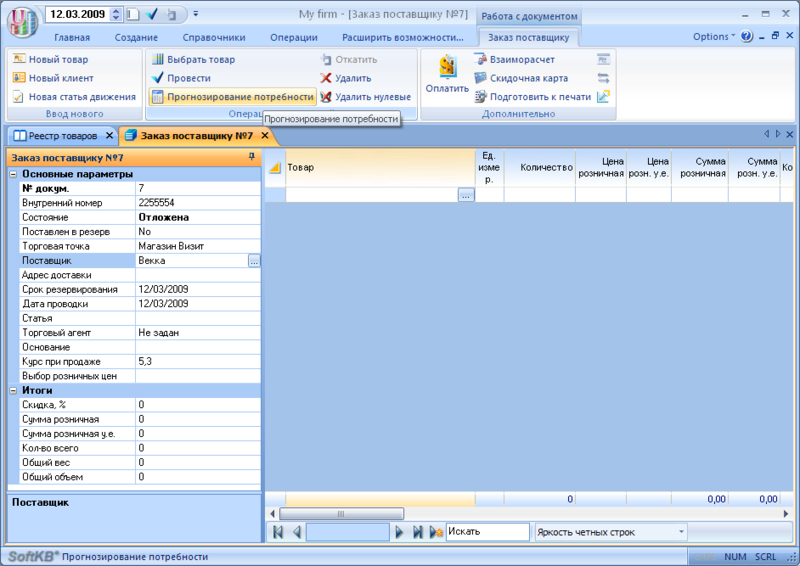 In ribbone tab «Creation» and select «New Order supplier». A new order, choose the supplier. In our case it is «Vecchio». Task is that in order automatically to include all products supplied «Vecchio» in the last time. This procedure is called «Calculation range». Once your range is, system must determine our needs for the future. The need for product is determined from the average demand multiplied by the number of days future period. In turn, the average demand is easy to calculate, estimating the volume of sales of the product for a period and divide this amount to Number of days period. As it turns out confused. Let us in a simple, at fingers. During the month of January (31 days), we have sold 122 kg of sausage. So, one day We sell an average of 122/31 = 3,935 kg. Deliver goods to our supplier again week. So, we need to order the product at 7 days of sales. Taking that sales in February, will be approximately equal to January, we evaluate our need for sausage: 3,935 * 7 = 27.548 kg. As you can see, nothing complicated. In real trade introduce more such a thing as a safety factor. Not really want to stay last two days, just without the sausage. Typically, this ratio is equal to 1.5 (half), but the program we will be able to regulate it. In addition, because ordered amount must be deducted already. That's up to us simple formula: (the average sales for the period * Number of days planned sales * 1.5) - (balance at the moment the recipient at the time of booking). Let's see how it works. On the content tab, select the order of our «Anticipation needs». A form of procurement planning. Period analysis of sales allows us to form range of the supplier. We just get a list of goods that vendor supplied us with during this period. 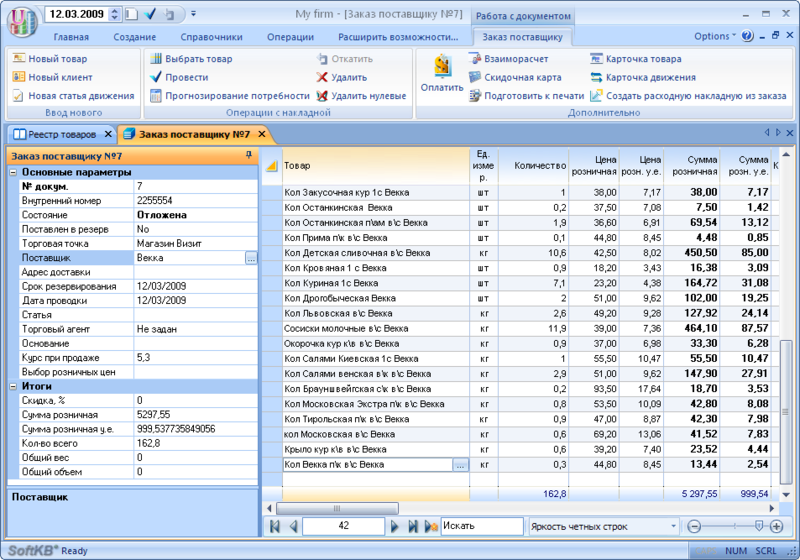 The second task, which involved during the analysis of sales - the average estimate of sales for the period. Period can be set arbitrarily. What period of more, the rich assortment of topics and a «medium» to be our average sales. How to deal with this period - Will come with experience. It has its nuances. And the material would be enough for another article. For example, it is not always good to increase the period of analysis, especially for seasonal items. Another interesting point - if the approaching holidays, the it would be interesting to «hook» previous holiday period, but there are features. March 8, it is not New Year's Eve, and preferences of the population to these different occasions on one product and the same for others. In general, the steering wheel we You pay in the hands, which arrive here, there and zanochuete. Since the period of planned sales are much easier. The resulting average sales simply multiplied by number of days of this period to assess the needs. Since the safety factor seem to be any difficulties, too, with rounded, too, understand. Tick «Only the selected supplier» limits the calculation range of only specified in the order of the supplier. If it is deleted, it will be a squash! Thus, it is not More. Read this: «If you remove the tick, the range will be included goods supplied by all vendors for the period of analysis ». «For all points ». Used when goods are delivered to a central warehouse, after the overhead allocated to the transmission of outlets, and we need to calculate sales from all outlets. «For the point group». When the supply goes to a local warehouse, where goods are distributed on outlets within the current group. For example, if a department store and shop together in one group and we are interested in selling only within the referred to the store. «To this point». When the sale goes to the same the point where the goods are delivered. The most frequently used in simple business structures. If you do not succeed after such a detailed article, well, write in the forum, promise that answer.